The sDrive30i is a rear-wheel drive SUV that can really outperform any other SUV on the road today. It’s an incredibly, fine-tuned engine that you’ll love to drive. It comes with lane keep assist, cross traffic alerts, blind spot monitoring, and tons of other safety features as well. The technology package has been upgraded quite a bit on this performance SUV. 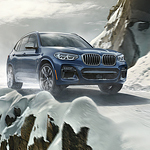 Want to test drive the BMW X3? Stop by Medford BMW for more information.